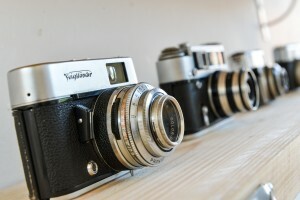 Came across these guys the other day in their virtual shop in Leeds Corn Exchange – http://wycameras.com . The guy I spoke to had some interesting lenses for sale and most seem to be available on the site. For me it was a bit like a stroll through a museum, they mostly sell only film ‘proper’ cameras. There in front of me was a bit of a beat up Nikon that I seem to remember was just as beat up when I was using it 20 years ago (2nd hand even then). Couldn’t find my first camera, the Olympus OM-10. They’ve got plenty of the bulky old Canons, Minoltas, some Medium Format cameras that take me back to my college roots (Remember the bronica ETRS which I sold to buy a cooker!) I even came across a 5×4 camera and was nearly tempted, but the effort seems hardly worth it these days. Seriously check them out, as they have some unusual lenses(some will work on your Digital SLR) and their 35mm SLR film cameras seem pretty good value, worth going for if you’d like to get back to developing your own.